Do you want to share large files over the internet? What do you do when the email attachment is not accepting the file due to large size? No worries. Here is the solution. If you want to share large files over the Internet then you can make use of any of the file hosting services like Dropbox, Google Drive, MediaFire, CloudMe etc. You can upload the big files and share downloadable link. There are a lot of online file sharing services over the internet. 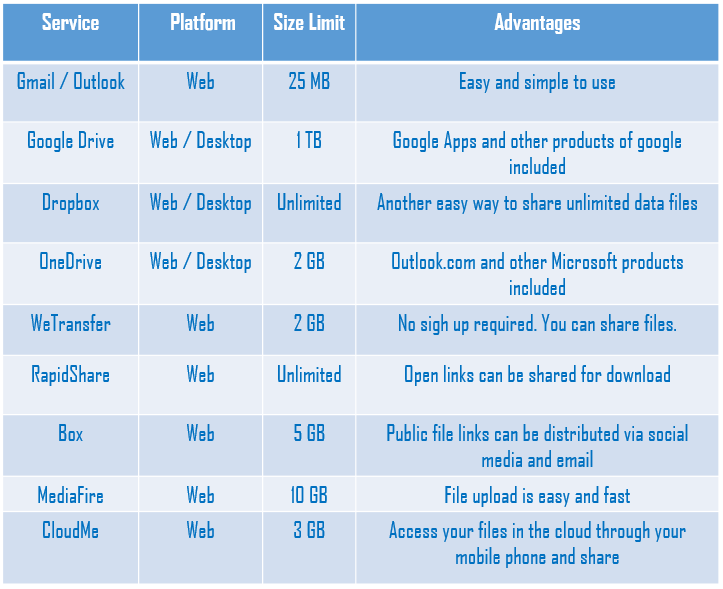 I have prepared a simplified list of services, the platforms they offer to share files and their maximum limit. Google Drive : The most popular online storage media and offers up to 1 TB. It supports web and desktop interfaces. For more support you can visit here. Dropbox – It is also very much popular and a lot people prefer this service over Google Drive. Here the files have no size limit if you upload them to Dropbox through the desktop application or web interface. WeTransfer — It offer you to share files up to 2 GB in size from the browser. The best part is that it doesn’t require to register for the service. It only takes recipient’s email address and it keeps the file for 7 days. Similarly RapidShare, Box, MediaFire and CloudMe have one thing in common i.e. you have to upload your files over Internet with different sizes as per the file size limit and quota. These file hosting services offer total space as specified in the above table. JustBeamIt : Now this will be a great feature if you can share files without even uploading them to any website. If you can send a file offline directly to someone very easily; in other words if you send files as peer to peer then JustBeamIt will be the best option. Peer to peer tool means that the file transfers take place between your computer and the other computer directly. Drag and drop option is also available on JustBeamIt website where it provides shareable link. If someone clicks on this provided link then the uploaded file will start downloading to the computer directly. If you are using Mac operating system then Infinit can be helpful in sharing files. It is also supported on Windows platform. Infinit uses your local area network and so the transfer speed is too fast. Hope the above file sharing options will serve you in case you want to share large as well as small files over the Internet or off the Internet.